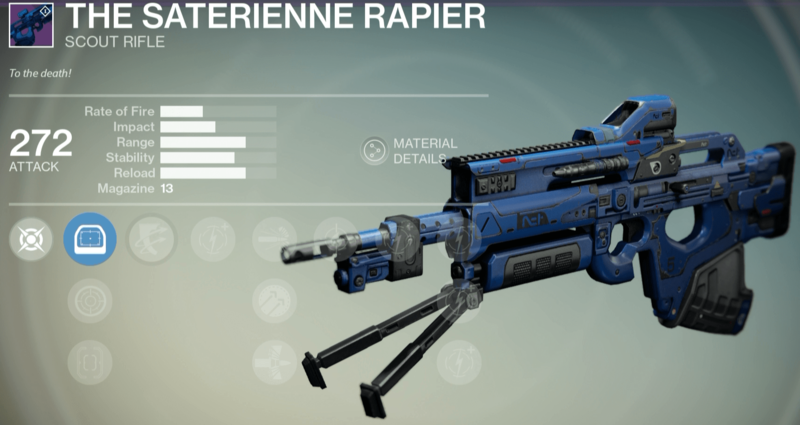 The Saterienne Rapier is a Legendary primary scout rifle. The good: High stability, quick reload speed, great default perks. The bad: Average range, low magazine size. Conclusion: Its vendor perks are too good to pass up. Cuts the reload speed in half. Increases the amount an enemy flinches when shot. Precision kills cause a Solar blast (50 damage) in a 5 meter radius. The Saterienne Rapier is a Legendary primary scout rifle which can be purchased from the Crucible Quartermaster for 150 Crucible Marks. The first thing you’ll notice on this weapon is its perks. It has awesome perks straight from the vendor; Outlaw and Firefly is reason enough to pick this up. 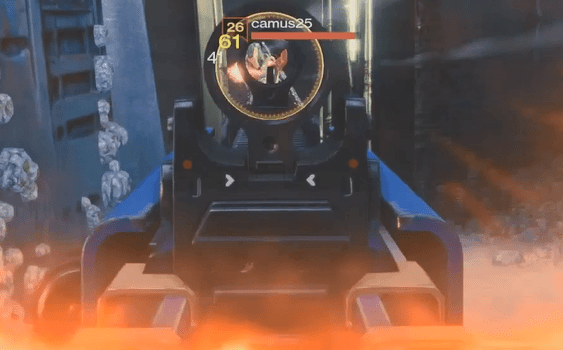 If you’ve used Fatebringer, you’re already familiar with how well these perks preform. Outlaw will decrease your reload speed after a precision kill, allowing you to reload in just 1.3 seconds. Without Outlaw, you’ll be able to reload in 2.2 seconds, which is better than most scout rifles. Due to the poor magazine size, the increased reload speed is extremely helpful since you’ll have to reload a lot. Firefly is going to serve you best in PvE since there’s a higher chance for enemies to be crowded around each other. After a precision kill, the Solar explosion will cause a considerable amount of damage in a 5 meter radius. The Saterienne Rapier has an average Impact and rate of fire, which thankfully puts it in a balanced/precision archetype. It shares the same Impact and RoF as Another NitC, Fang of Ir Yût (full review), and Vision of Confluence. You’ll be able to unleash a full magazine in 4.5 seconds. In PvE this weapon will do 340 body damage to a level 30 tier 1 enemy and 1019 damage if it’s a critical hit. 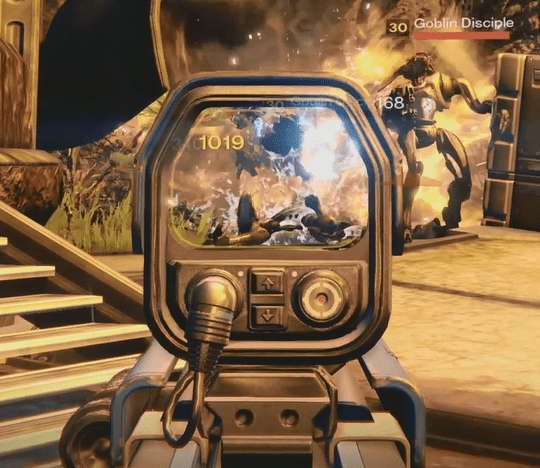 In PvP you’ll hit for 41 to the body and 61 to the head, so 4-5 shots will take out any Guardian in your path. The range is also average, but with Hammer Forged it can be increased considerably. The base range is certainly not the lowest (B-Line Trauma) but well below the highest (Proxima Centauri II). Where The Saterienne Rapier excels is stability and reload speed. Its tied for second place for highest base stability so Ranged Lens RLR5 and QuickDraw IS are both extremely good options. Red Dot-OAS, the default sight, will give you the most stability but the openness and extra range from the Ranged Lens RLR5 is probably the best option. Its reload speed is also at the top of the charts, just slightly slower than Dead Orbit’s Crypt Dweller SR1. The base reload speed is 2 seconds, but as long as you’re killing enemies with precision damage, that time will be cut in half. If you’re a Gunslinger, be sure to use the Gunslinger’s Trance and Chain of Woe talents for ultimate precision and a lightning fast reload speed. The Saterienne Rapier has one major flaw, and that’s magazine size. Most scout rifles have 15+ rounds, or at least Field Scout to help out, but the vendor perks do not offer any help for the low magazine size. 13 rounds will go super quick in PvE so you’ll want to ensure you’re hitting as many critical hits as possible. The extra damage from Firefly is going to help alleviate the time you spend reloading, and with Outlaw, thankfully that won’t be too long. The low Impact and average range make this an OK scout rifle for PvP, but Badger CCL or Gheleon’s Demise with the right perks would be more powerful. Two perks that are much better in PvE are Firefly and Armor Piercing Rounds. The chances that two Guardians will be close enough to consistently make use of those perks is slim. It’s still worth using in PvP, but it’s better suited for PvE engagements, specifically encounters like the Abyss in Crota’s End where Firefly can cause massive damage. With two of the best perks, this weapon is hard to ignore. For anything that’s not the Crucible, there’s little question that this is one of the best vendor weapons you can buy. Unfortunately it doesn’t have elemental damage like Fatebringer, but The Saterienne Rapier is arguably easier to use. In PvP it does pack a punch, but try for a scout rifle with more PvP-oriented perks or a higher magazine size like B-Line Trauma or Another NitC. Even with its flaws, it’s absolutely worth buying, and a contender for the best vendor primary. For PvP this weapon earns a 7.6/10 and for PvE a 8.7/10.